Description: Vigorous woody climber to 6 m high. 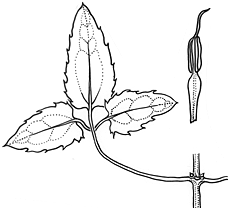 Leaves mostly ternate (or simple on juvenile plants); simple leaves and leaflets ovate, usually 20–100 mm long, 10–45 mm wide, margins with few to many teeth or occasionally entire, if teeth numerous then spaced ± evenly around margin. Sepals white. Anthers 2–3.5 mm long; appendage ³ 1 mm long, subulate (usually also detectable on staminodes of female flowers). Mature achenes ellipsoid in side view, with an often pale but little-thickened margin. Distribution and occurrence: Widespread on the coast and ranges, in moist or sheltered sites, usually in forest.